This Little Hack has a major help for us Like in blogger templates we have blog Title Tag First On the Browser top Followed by the Post Title But with this Hack We will see the Post title Tag First Followed By the blog Title Tag And This Is help Full For us In Seach Engine. When Some Body Search For Our Any keyword and By Chance We our post has the same keyword than our post title will be displayed on the first followed by title tag. This Hack Works only After the Google refresh his Indexing. now replace this with your own hosted picture Url you have to repeat this twice. and replace this With your Own code. Sign In to your Google Analystics get the code from google analystics for your blog and then search for the code start with UA this is unique tracking Id for Your Blog copy this to note pad now come to your template HTML Code and search for "UA-xxxxxx-x" And Replace this One With your Own Code. For the six 125 x 125 banner ads you’ll need to find “” and update those one by one. Make sure not to delete the <li> and </li> before and after each ad otherwise it will look funny. If you don’t already have ads to use, I recommend clicking through each banner and become an affiliate. Then you can replace the affiliate codes with your own and start making money! Earn Some Extra Money by Refereing Advertisers and Publishers to both sites. Visit Them Register Your self And get your Uqniue referal Ids Go to Edit HTML Search For www.linkworth.com replace '27944' with your unique Id and search for http://www.widgetbucks.com replace '2569003'with your Id. Let’s start with the 468 x 60 header banner. Search for “” in the template code and the first one you come across is where you replace the ad. The second instance of “” is for the Google AdSense code which you can either keep, replace, or just remove completely. 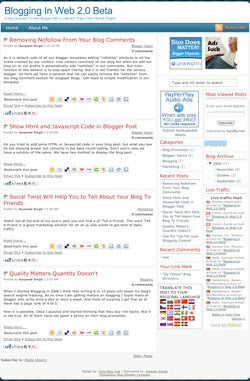 For This Now go to Layout Page Element Click on Add A Gadget then Click On Feed in List of All Gadgets Now Enter http://YOUR-BLOG-NAME.blogspot.com/feeds/posts/default (Please Replace Your-Blog-Name With Original Name OF Your Blog) Click Contiune In title Type 'RECENT Post and Save It. Again Repeat the same process Now Enter In Feed Field below Code for comments http://YOUR-BLOG-NAME.blogspot.com/feeds/comments/default (Please Replace Your-Blog-Name With Original Name OF Your Blog) Click Contiune In title Type 'RECENT COMMENT and Save It. For This We Have To Make Some Setup Go to Setting --> Comments--->Check the Box Embedded below post. And We Have Done With Comment Form. Now When ever you want to Show Big Article In Summary With Read More Link Then write your article between the code we have entered. This Hack Works With The Labels Posts Have Same Label Will be Displayed In the End of Every post. Buttons For Major Social Bookmarking Sites. Hope This Template will suit with the all needs of Some blog tips, Tricks,Hacks & Plugins.Don't Forget To Leave Comments About This One. i have kept comment on new demo blog. i have also created new blog and instaled new template. i will check and further tell you .